Welcome to Day #8 of Chocolate and Berries Theme Week. Today's Raw Organic Superfood Smoothie Mix from Sunfood Superfoods (El Cajon, CA) contained so many berries (maqui, goji, acai, banana*) that it single handedly supercharged this berry theme week. And, yes, along with many other ingredients (brown rice protein, chia seed powder, lucuma powder, camu camu (fruit) powder, organic vanilla powder, pink Himalayan salt, etc. 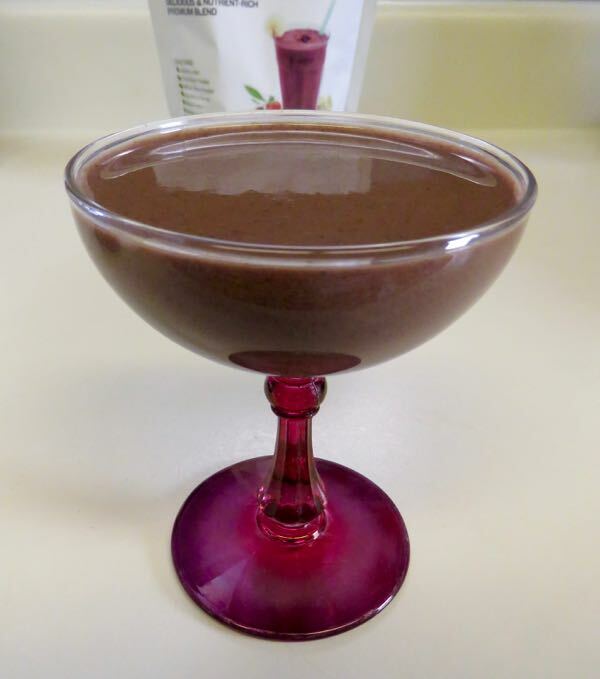 ), this mix contained organic cacao powder. The powered form provided a convenient way to ingest berries and cocoa. Next time I'd probably boost this smoothie mix (made just with water today) with some fresh berries/fruit to make life more interesting. As the package suggests, this blend can be used as a base for other inclusions and/or milks of your choice. 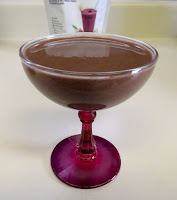 However, in case you just want to shake up some mix with water to drink on the go, the chia seed powder helped provide some binder that held the smoothie components together, preventing residue from coating the glass and making cleanup a breeze. 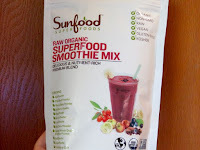 This smoothie mix was gluten free, organic, Non GMO, raw, vegan and kosher.